We use careful quality control to ensure that our products meet state, local, and customer specifications. National Lime and Stone delivers asphalt and concrete to an array of project types directly from our state-of-the-art plants. Our team will work with you from beginning to end to ensure that our application is right for your project and that each load will meet the specifications necessary for your success. 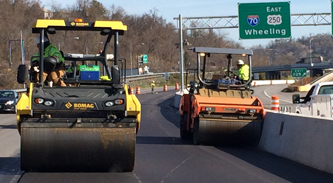 Our legally separate and independent entities, NLS Asphalt, Inc., NLS Paving, Inc., and NLS Transport, Inc., have a full range of asphalt production and laydown capabilities to finish your project on time and on budget. With a knowledgeable and experienced staff, NLS is focused on providing superior service and high quality products to service state departments of transportation, as well as oil and gas, commercial, and residential customers. With multiple asphalt plants, paving crews and an ever-expanding aggregates rail network, National and NLS are the premier suppliers of high-quality products to the Utica Shale market. With strategically placed assets throughout the entire region, we are your one-stop shop for aggregates, asphalt, and roadbuilding. We deliver our ready-mix concrete to residential, commercial, and highway projects directly from our batch plants using our own fleet of both front and rear discharge ready-mix trucks. 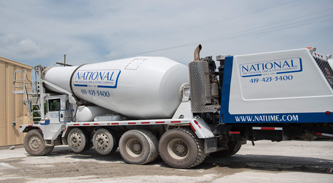 The National Lime and Stone Company also utilizes its own internally developed, patent-pending cement replacement, NatCrete, to enhance the properties of the concrete. We actively partner with architects, developers, contractors, homebuilders and homeowners who are looking to customize their project.